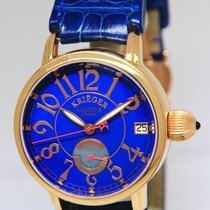 The Krieger Watches brand produces some of the most exquisite timepieces and has quite a history behind its launch. The roots of Krieger Watches go back to one man’s quest to create a watch that would accurately predict low and high tides for better navigation of the waterways in South Florida. This created an entire market for tidal watches by revolutionizing the concept. From the production of the Tidal Chronometer in 1987 to the launch of a company, and the resulting giant leap the brand has since taken, Ira Krieger certainly did live up to his dream. Today, Krieger Watches is a name to reckon with among the most prestigious and luxurious timepieces. The popular models of Krieger watches these days are those from the Chrone, Elite, Gigantium, Lunar, Marine Chrono, Mysterium, Power Reserve, Sea Stallion and Tidal Wave collection. The special edition Krieger watches like Bertram, Plethora, Skeleton Skeleton, Streamliner and Pliner are also in demand. Each of these models is also found in further sub models with their own set of specifications. The movements of each of the Krieger watches vary from self-winding automatic, automatic, manual wound mechanical to quartz styles. Additional details in movement may include the presence of COSC Swiss chronometer, a 42 hour reserve or thermal compensation. 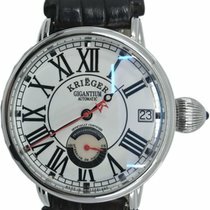 All the models of Krieger watches have double dome and anti-reflective sapphire crystal. The diameter of the Krieger watches vary from 51 mm, 44 mm, 43 mm to 38 mm. The Krieger watch cases are found in numerous varieties such as the stainless steel type, which can be further categorized into plain, matte or highly polished. Some of these stainless steel cases are specially constructed to make them indestructible. The Krieger cases are also found in 18 kt rose, yellow or white gold. A few of the cases are PVD processed, while others are made with aluminium and feature seamless frames in stainless steel. Many of the Krieger watches have elaborate bezels with 75 or 86 diamonds that range from ¾ to 1 carat. Some of the Krieger models also have a solar compass or depth indicator bezel. The variety of dial colors and skeletons offered by Krieger are huge. 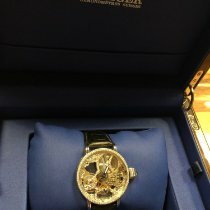 Some of the models have features like digital analog dial, reserve de marche, date window or are hand carved and engraved. 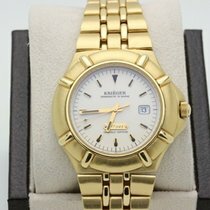 The water resistance varies according to each Krieger model, and could be anything from 3 ATM, 5ATM, 10 ATM to 80 ATM. From an oversized king’s crown with a sapphire tip to a specialized engraved K, there are quite a few types of crowns that can be seen on these watches. Some of the Krieger models are screwed down or have screwed down push buttons. The Krieger brand ensures that it is a step ahead even when it comes to the presentation of detailing on the back. It is no wonder that some of the most exquisite features are a part of Krieger backs. These include designs like the exhibition of sapphire crystal, screwed down case, engraved relief of a compass rose or a large relief case. Two models, namely the Sea Stallion and Bertram, have an engraved relief of their own logo. All the models of Krieger watches have a 20mm unique divers cut. Some of the Krieger watches have interchangeable straps, these include the models like Chrono, Elite, Gigantium, Marine Chrono, Mysterium, Power Reserve, Plethora, Skeleton Skeleton, Streamliner and Pliner. The straps of the other Krieger models like Lunar, Sea Stallion, Tidal Wave and Bertram are fixed. However, there are various types of designs found within the fixed straps too. The straps make use of alligator skin, galusha, python, mink and rubber, and are further available in a multitude of colors. There are also bracelet style straps available in stainless steel and gold, some of which even have diamonds. The Krieger brand produces watches for both men and women; these beautiful timepieces transcend generations and can be worn by anyone irrespective of age. Each and every Krieger watch is manufactured in Switzerland and makes use of the superior Swiss techniques that are orchestrated by hand. The exquisitely crafted designs from Krieger are made to withstand the passage of time and have an heirloom quality about them.